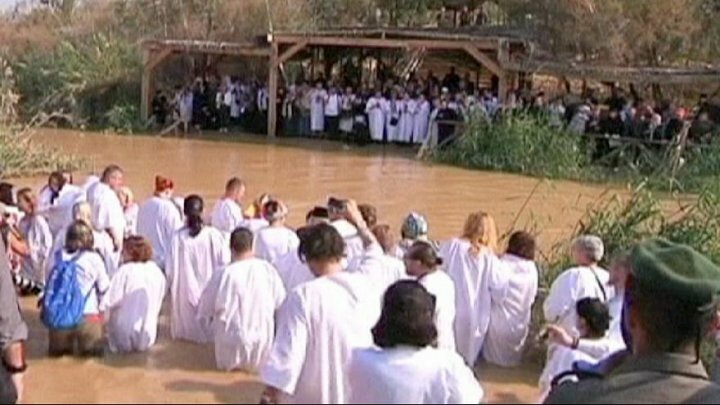 Greek-Orthodox Christians and faithful from other Eastern Churches attended an annual ceremony at the Jordan River on Friday, to commemorate the baptism of Jesus Christ. Hundreds of pilgrims arrived at the Qasr al-Yahud site, near the Palestinian town of Jericho in the West Bank, where they held a ceremony marking the feast. The spot is close to where the River Jordan flows into the Dead Sea and is considered the third most important site in Christianity after the Church of the Nativity and the Church of the Holy Sepulchre. Following tradition, the Greek-Orthodox Patriarch of Jerusalem, Theophilos III, threw a cross wrapped in a branch of basil leaves several times into the river's waters.